Interior decorators know that window coverings make or break a room. Some people believe that curtains can be heavy and outdated but, when chosen correctly, we believe they can be an excellent addition to the style of your home or office. Our team of experts have put together some helpful advice on selecting the right curtains for your design. Fabric is an essential consideration when choosing curtains as the material you work with will dictate the functionality and lifespan of your window coverings. If they are too heavy, you may experience difficulty when drawing them open or closed. If they are too light, a simple breeze can hinder how they fall. 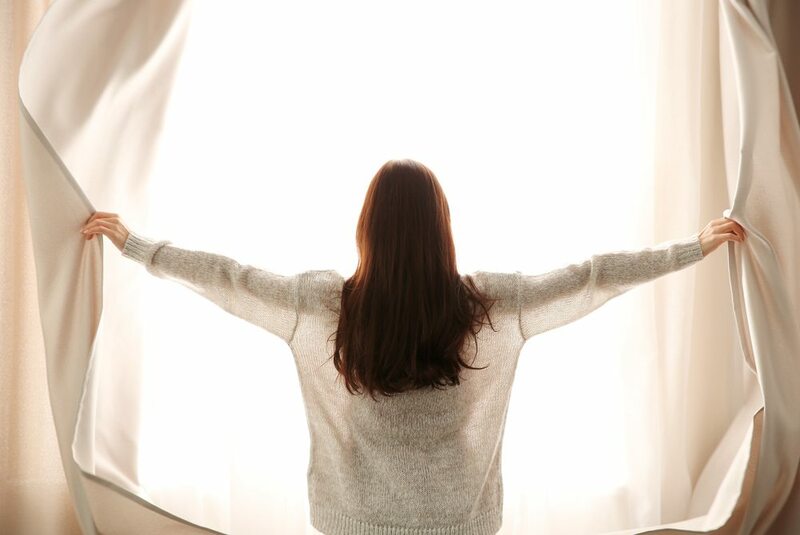 Remember that sunlight will fade your curtains over time so, unless you intend on frequently changing your room design, it may be wise to avoid bright colours. Neutral colours are less likely to fade and will blend well with your individual room décor. Experts agree that the best fabrics for curtains are linen, silk and velvet because they tend to fall well. Some fabrics will help to keep out the cold and insulate your home so take the Brisbane weather into account when choosing your style. To give a feeling of height and space to a room, hang your curtains further above the window and allow them enough length to fall completely to the ground. Measure from where you would like the curtain rods to sit – if a more traditional look interests you, add a few extra inches to the length to allow the curtains to puddle slightly on the floor. Be sure to allow room on either side of the window to ensure your curtains are not stretched open too far. The extra width will ensure you minimise light creeping in through the sides of the window. Sheer curtains allow you to enjoy your view while removing excessive UV exposure and brightness to a room. However, these curtains do not protect from noise and harsh temperatures. Block out curtains are a fantastic choice for bedrooms and loungerooms as they allow complete light control while also reducing sound from noisy traffic or neighbours. To create a cinematic feel for your loungeroom, consider installing block out curtains that will maximise the atmosphere of your entertainment system. Pairing a sheer curtain with a block out curtain is an excellent way to have the best of both worlds as they protect your furniture while allowing you a comfortable night’s rest. Speak to your window treatment specialist to find out how you can perfectly customise your curtains. Modern Blinds offer a broad range of curtains for your renovation or new home build in Queensland. Visit our extensive online store or call 07 5606 7661 (Gold Coast) or 07 3290 5777 (Brisbane) to get your project underway with a free quote!